On the day the world celebrates International Adivasi Day, Abla, Gemtiya, Pandya and scores of Adivasis are helplessly watching their only source of livelihood drowning in the Narmada River. These tribes are among over a dozen families in the Bhadal village of Barwani region in Madhya Pradesh affected by the Sardar Sarovar Sam project. While the villagers are accustomed to seeing their fields inundated every monsoon since 2006 - the year the Sardar Sarovar dam was commissioned - things might get worse for them from the next year. The authorities have decided to close the dam's sluice gate and fill it to full reserve capacity, raising the height of the dam from existing 122 metres to 138.68 metres. The decision could spell doom for over 50,000 families spread across Madhya Pradesh, Gujarat and Maharashtra as around 244 villages are likely to be submerged after the water level goes up. Considering the past record of failed rehabilitation promises made to the dam-affected people, those faced with the prospect of losing their belongings are now resorting to a do-or-die battle against the government. The nondescript town of Barwani is painted in the colours of protest these days. The rallies, posters, and activists pouring in from far-flung places have created a new buzz in the town. 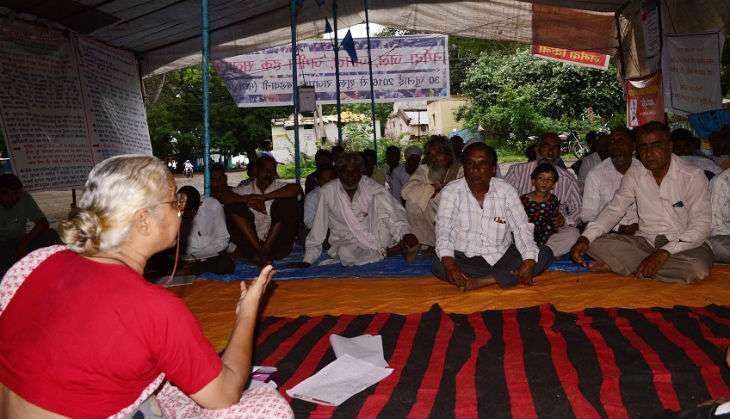 Hundreds of villagers and social activists of Narmada Bachao Andolan (NBA) are waging an indefinite protest at Rajghat in the city against government's decision to raise the dam height. "The anti-POSCO protesters have come all the way from Odisha to join the movement. Along with the local fishermen, farmers, tribal and other dwellers, students from Delhi University and Jawaharlal Nehru University also came to support," The Times of India quoted Medha Patkar as saying. Every day, people of 4-5 villages sit on a dharna on the rotation basis. The agitation is only intensifying as the Narmada water usurps more villages. The activists are threatening to take 'Jal Samadhi' if the government does not provide them land as compensation. The officials, on their part, have only promised money to the dam-affected people. But, even the compensation money has not been distributed properly, allege activists. Meanwhile, the state government has deployed heavy police force in Barwani and Section 144 has been imposed in the city. Last week, the protestors were not allowed to meet the Collector triggering heated exchanges between the agitators and the police personnel. The NBA activists have also accused the administration of misbehaving with the women. Amid the agitation, the situation is worsening in several villages along the Narmada river as the water levels continue to rise. The Narmada was flowing above the danger mark of 125 metres on Monday. Dozens of villages in Madhya Pradesh have been inundated, several others face the threat of submersion. The water has already started to enter the hilly villages of Barwani region. The residents of villages like Tuerkheda, Karhi, Dhajada, Kakrana are reportedly fleeing from their houses for safer locations. The rampant illegal mining along the banks of Narmada has made things worse. Local analysts say the further increase of even a metre in the water level would result in the drowning of several other villages including Picchodi, Pendra and Chhota Badda. The situation has been further aggravated by the opening of the gates of the Indira Sagar and Omkareshwar Dam. The district administration has issued a high alert in the region and arrangements have been made for relief and rescue operations. "We have made all arrangements in the affected regions. The speed at which the water level is rising is decreasing. The chances of water reaching the Picchodi village are remote," assures Hridayesh Shrivastava, SDM, Barwani. But, these assurances have done little to allay the fears of the agitators, who say they are waging a battle on wider issues. "We are demanding the complete rehabilitation of the dam-affected people. They should get agricultural land as the compensation. The government must provide employment opportunities to these families. It is not right to build large dams without proper assessment. The Sardar Sarovar is world's second largest dam. But, thousands of people have still not been rehabilitated," says Medha Patekar. According to NBA activists, the Modi government had decided to raise the water level of the dam to 138.68 metres soon after coming to power. This is in contravention to the Supreme Court verdict that the status quo would be maintained till the rehabilitation process is over, they allege. Medha Patekar claims the PMO forwarded a copy of the report prepared in 2000 as a response to their queries. "The report states the dam would be completed in 2004, whereas the answer has been given in 2016. This proves the government apathy for the plight of around 50,000 dam-affected families, she laments. Besides demanding agricultural land for the displaced, the agitators are insistent that the government should not allow the raising of the water level till the rehabilitation process is over. They are also against the closing of the gates of the Sardar Sarovar dam. Furthermore, the NBA also wants the recommendations of the Jha Committee report to be made public. The Jha Committee was set up by the Madhya Pradesh High Court in August 2008 to probe allegations of over 3,000 fake land sale registries, issuance of livelihood grants, corruption in rehabilitation sites, allotment of plots for construction of houses to the displaced in Alirajpur, Dhar, Khargone and Barwani districts of Madhya Pradesh. The other demands include clarification on the official claim that there is zero balance in rehabilitation while over 15,000 families are still living in the affected villages. The NBA activists want the government to provide the right of fishing to local fishermen and assistance for the landless farmers to establish their own sources of livelihood. The closure of the sluice gate of the Sardar Sarovar Dam is likely to impact around 244 villages. Out of these, 192 villages are in Madhya Pradesh. Over 25,000 hectares of land is under the threat of getting submerged affecting over 50,000 families in MP, Gujarat and Maharashtra. More than 30,000 families are still living in the affected villages due to the lack of rehabilitation. Most numbers of afflicted families are in Madhya Pradesh. Yet, the state will not get any water from the Sardar Sarovar reservoir. It will be entitled to 57% electricity produced from the project. While the Madhya Pradesh government has still not taken any action in the alleged rehabilitation scam estimated to be worth around Rs 1,000-1,500 crore, the Gujarat government has also reduced the command area of the Sardar Sarovar to divert the water for industries. Also read:The desert states of India are flooding. What's really going on?